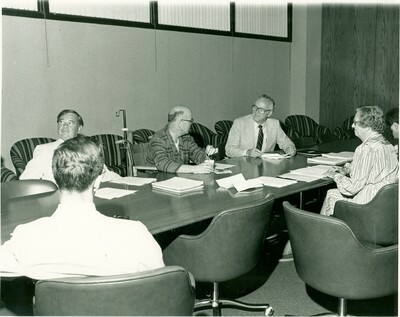 Here we have (from left) Lloyd Jones, Abram Sammels, looking at the first CEO of Lehigh Valley Hospital, Ellwyn Spiker, right rear, in the original ASHHC board room. Across the table is seated Mrs. Valeria Boyer. Do you recognize anyone else?